the original photo stock in that i was based. Queenie Law is the chara's design of the scan that i used. I also tried to say something, this wallie is a gift for alterlier. Well that is really cool! Such an interesting idea. I like it. Well Done. hai hai bueno a ver, ya se que me demore, bastante, pero recuerda lo perezosa que soy para responder a estas cosas (aunque no estoy diciendo que me de pereza responder esto, al final me lo dedicaste a mi, tu me entiendes, espero)....este wall me dejo bastante impresionada viendo lo que fuiste capaz de crear con esa foto y es que igual se ve genial, aunque el color sea algo ya caracteristico tuyo creeme que le queda a la perfeccion....al menos yo no me lo imagino con un tono azul. naa hermano ya le habia dicho que este wallpaper simplemente me habia encantado...pero por otra parte ahi lo tendre de adorno ya que tu sabes...no todos tienes una resolucion de 1600x1200 kof kof. uhhh....O.O too much spanish! hehe. no puedo comprender que todos escribieron. sorry for the awful spanish. im still learning! what a lovely wallpaper! Im sorry I wasnt able to comment sooner....a little delayed by headaches and a messy room. Very nice concept. Youve done a great job in filtering the wall and window so it looks anime-style. The doujinshi you used fits perfectly with the scene. the only part that kind of looks out of place is the tree leaves on the side. Is it supposed to be a tree shadow, or a tree? it kind of looks like a stain...maybe if you added a couple more leaves toward the side, it would look like a complete tree. If its a tree shadow, I also suggest lowering the opacity of it a little. the geko on the wall is a nice addition and it makes the right wall interesting, but then the left side wall looks a little plain. Good job overall though! I do like your unique walls like this better than the angelic walls. ^-^ Im going to add you to my watch list okay? Can't wait to see more! oohhhh this so interesting . . . it was a very good idea and i'm ery impresed for what you are able to make! OX Looks very realistic, maybe its the colors and i just love it.! Nice job on this. I just love the colours. WOW~ Beautifully composed~ I love the effect you used! Thanks for sharing! Great job! and this efects are great! Interesting, really it has something, but I believe that as you say you such occupied colors that in the previous work, but good, are part of the inspiration that is had, then. 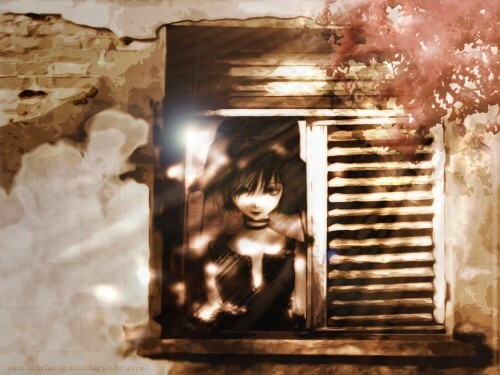 It gives a little fear the expression of the girl of the window, something deep that glance and something me mysterious. I congratulate to you to obtain those ambientaciones and changes in the images, are seen well! i can almost feel the picture...sure has emotions in it!